Kingston Plantation South Hampton is in the Shore Drive area of North Myrtle Beach, South Carolina. This luxurious beach vacation rental condo and resort stands right off of the ocean shoreline, giving guests an amazing view to wake up to in the morning. The kind and welcoming staff of the resort will make you feel right at home. Kingston Plantation South Hampton is a perfect destination for families, with plenty to do both at the rental condo and in the area of North Myrtle Beach, South Carolina. Start your day out on your private balcony, looking over the beach as the scent of ocean breeze washes over you. Take a small drive away to the many great attractions of the area. Hit the greens at a beautiful local golf course. Watch a live show at a local theatre. Visit a local winery. Rent a horse to take a tour of the coastline on horseback. Take the short walk down to the beach from your rental condo to relax in the sun, swim in the ocean, or throw around the football. The Kingston Plantation South Hampton is nothing short of paradise. 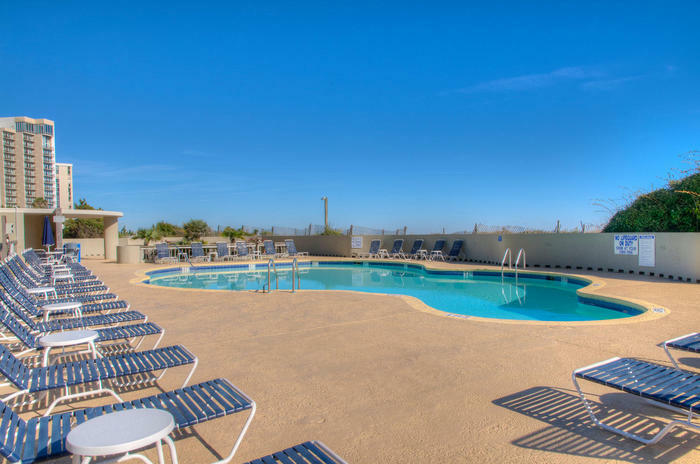 The oceanfront pool deck is great for both children and adults. The white sandy beach of the Atlantic Ocean stretches on for what seems to be endlessly. The melodic sounds of the waves crashing against the shore can be heard from the pool deck. Kingston Plantation South Hampton is perfect for families, with plenty to do for patrons of all ages. The nearby area of Shore Drive in North Myrtle Beach, South Carolina has much to offer, from delicious local food and a wide selection of stores to shop at, to going to the beach to enjoy the ocean scenery and relax in the sun. The interiors of the units in Kingston Plantation South Hampton are beautiful and wonderfully luxurious. The rooms are three-bedroom, three-bath that can easily sleep 12 guests. Each room comes with two DVD players, four televisions, and comfortable beds that vacation-goers can enjoy after a long day of sightseeing and fun in the sun. The rental condo also comes with a washer and dryer unit for guests’ use. Kingston Plantation South Hampton is gorgeous, whether you are spending your vacation on your own or with friends and family, this resort and the local area has something for everyone to enjoy, young or old. Elliott Beach Rentals is not affiliated with onsite management or the HOA of Kingston Plantation South Hampton.